An image from Stephen Lerner and Reuben Aaronson's 'Strangers In Town,' about Garden City, Kansas. "One thing that's clear is that there was a group of people in the city government, the law enforcement community, the schools (and) the religious community that made an explicit decision to make this work in their town," filmmaker Stephen Lerner said on a recent edition of KCUR's Up to Date. Garden City made national headlines after news broke that three men planned to bomb an apartment complex that housed more than 100 Somali Muslim immigrants and a mosque on the day after the 2016 presidential election. 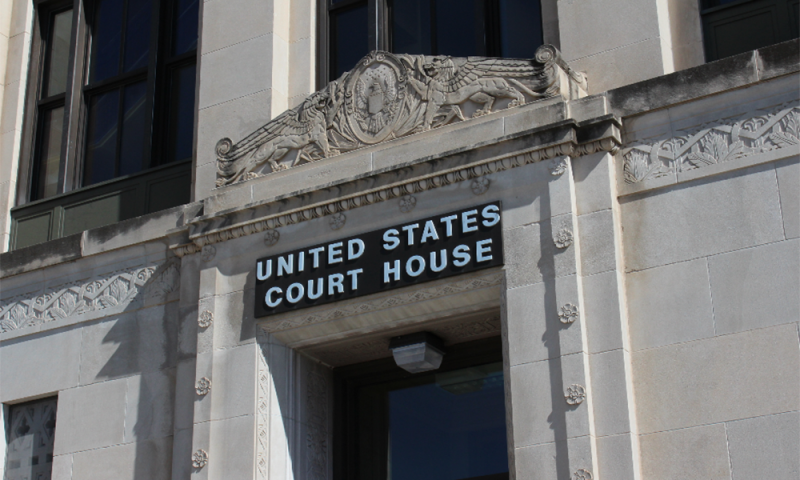 Last year, Curtis Allen, Patrick Stein and Gavin Wright were found guilty of conspiracy to use a weapon of mass destruction and conspiracy to violate the housing rights of their intended victims; Wright was also convicted of lying to the FBI. They were sentenced in January. After residents learned of the attempted bombing, Garden City banded together to support the immigrants. "The target of the attack was going to be the Somali community, a Muslim community, an apartment complex. The town really rallied to them," Lerner said. "Everyone was there rallying to support those Somali folks." None of the men convicted of the bomb plot lived in Garden City; rather, they were outsiders who knew of Garden City's reputation for inclusion. "What makes Garden City work, is we work together," Garden City Chief of Police Michael Utz says in the film. "Working together, playing together, and grasping the diversity that individuals bring to the community as a positive rather than a negative, makes us whole as a community. There's really no room for divide on where you came from, the color of your skin, sexual orientation. There's no room for hatred." Lerner, who lives in Lawrence, made the film with his lifelong friend Reuben Aaronson, the founder and creative director of NGOFilms in Los Angeles. The two thought a film about Garden City's response to immigration might inform the national dialogue. "After all," Lerner said, "here’s a conservative part of Kansas, right-leaning town, that has totally embraced the notion of diversity and immigration. (There were) some undercurrents of protest, but from the civic leaders on down, they said 'We're gonna make this work.'" In the late 1970s, Garden City had about 14,000 residents and a low rate of unemployment. So, when the world's largest beef packing plant opened 10 miles west of town in 1980, residents knew that outsiders would have to fill the new positions. The town braced to receive thousands of workers. Then, three years later, another plant opened to the east requiring just as many. By 2000, the two plants employed 5,300 people, most of whom were newly migrated hourly employees. The town has a history of robust immigration. According to the film, the 1910 census showed that 25 percent of the people who lived in Garden City at that time were born in other countries. So, as in every other area of the United States, even residents who aren't recent arrivals are descendants of immigrants. 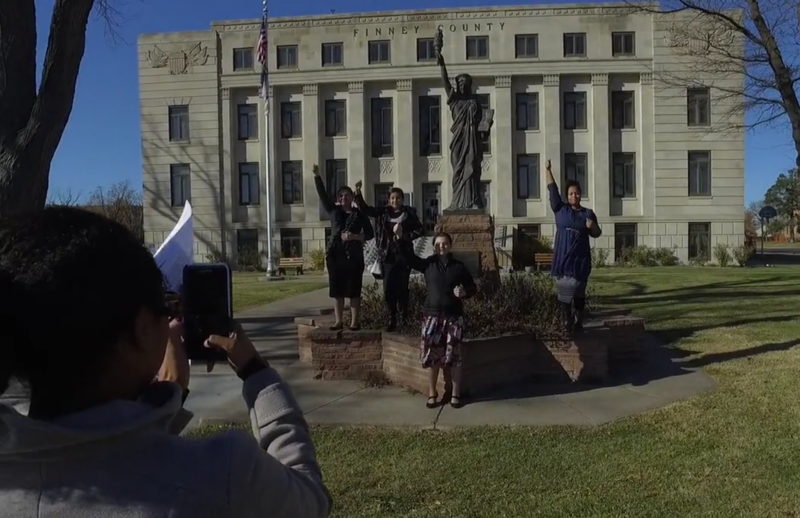 In a scene from 'Strangers in Town,' Garden City residents pose in front of a miniature Statue of Liberty in front of the Finney County Courthouse. The documentary allows students at Garden City High School — where 24 different languages are spoken — to illustrate that point. Luz Labra says her parents were shunned when they first moved to Garden City. "I feel for outcasts or people who are different…" she says before trailing off. Her classmate, Eresay Alcantar-Velasquez, whose parents were both born in Mexico, picks up Labra's thought: "Because your parents went through it. Your parents are your family, are your home. Why would you want to make someone feel unwelcomed?" Another student, not a child of recent immigrants, says he's able to see the life he's accustomed to through the eyes of the newcomers. "It opens up my eyes, like we take all this stuff for granted. It makes me want to work harder and appreciate things more," says Jasper Partin. Lerner told Kraske that his hope with the film is "that people will think more about this immigration issue in a way that can break down some of the stereotypes and the polarities. We have to remember that most of us, except if we're Native Americans, came from some other place." “Strangers in Town” screenings: 7 p.m. Tuesday, February 19 at Washburn University’s Neese Gray Theatre, 1700 SW College Ave., Topeka, Kansas 66604; 3 p.m. Thursday, February 21 at the University of Kansas’ Hall Center for the Humanities, 900 Sunnyside Ave, Lawrence, Kansas 66045; 7 p.m. Thursday, February 21 at Emporia State University’s Visser Hall, 1701 Morse Rd., Emporia, Kansas 66801. Listen to Stephen Lerner's conversation on KCUR's Up to Date here. This is a two-part story on immigrants and small town viability. Part one aired on this Weekend Edition Saturday. For the full story, listen to both audio segments. 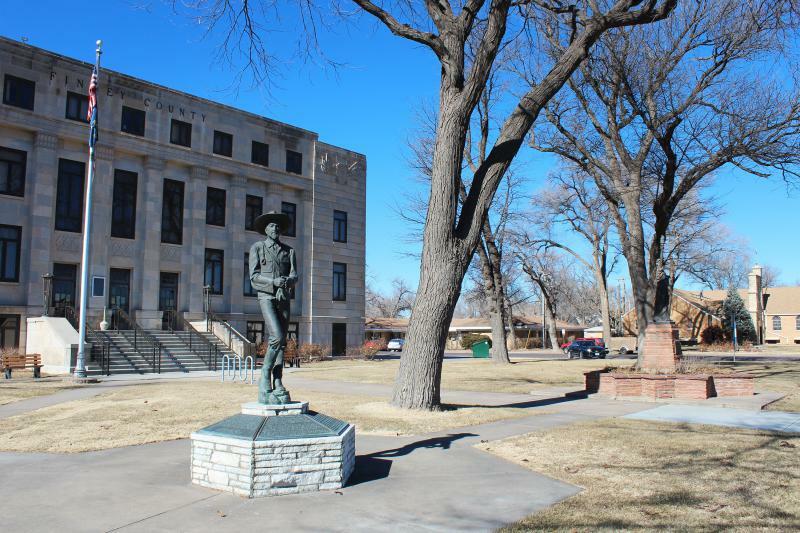 Like thousands of rural towns across the country, Cawker City, Kan., was built for bygone time. Resident Linda Clover has spent most of her life in Cawker City, and she loves the place, but it's a shell of the town it used to be.